I have never been big on making homemade soups. However, since I have become more and more aware of how unhealthy canned soups can be for you because of the added corn syrups, salt and preservatives, I have wanted to reconsider. My daughter has always loved New England Clam Chowder so when I was roaming around in one of my favorite cookbooks (The Complete Cooking Light Cookbook) a recipe caught my eye since it was called New England Fish Chowder. It is pretty simple in the ingredients and looked to have all the qualifying elements for a New England Chowder from a little butter to diced potatoes. What was interesting is that the recipe calls for non-fat milk instead of a rich whole milk or half & half. I was a little nervous about how satisfying a non-fat milk based soup would be. Although it is hardly a thick soup, it was creamy and tasty thanks to the roux you create in the beginning and the potatoes. It was definitely thick enough. Everyone enjoyed the soup. It will be a repeat. The per serving calories for the soup are 299. 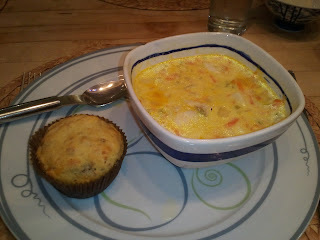 I completed the meal with homemade Bacon- Cheddar Corn Muffins (see yesterday's blog/142 cal per muffin) and a tossed green salad with 2 tablespoons of your favorite dressing (50 cal) for a total of 338 calories for the meal.